We are back with yet another edition of Sampada. This month we hit 90 editions and with just 10 more go for hitting the century like namma UVCE we are ecstatic. 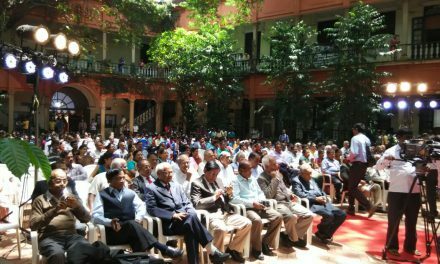 Sampada has always been our dream to preserve the essence of UVCE and its happenings each month and simultaneously function as a window for namma Alumni. 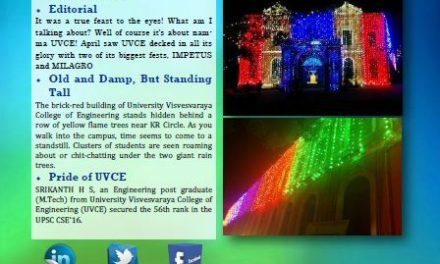 And similar is immense effort in designing Avalokana, a souvenir to mark the Centennial Journey of our Alma Mater through photos, articles and thoughts and experiences shared by all the UVCEians. It is also an immense pleasure at this glorious moment as we shout out loud with pride the nearing of August 5th which will witness the launch of Avalokana hosted along with a cultural evening. Find all the details inside. Flipping inside this edition you will find an exclusive interview with our Placement Coordinators for the batch of 2017-2018 in conversation with our Team Sampada, details of General Body Meeting of Alumni Association on 15th July and much more.